Delivering drugs to the spinal cord, where pain signals are relayed from the peripheral nervous system ultimately up to the brain, is a desirable approach to quelling pain, but targeting agents to precise locations in that area has proved challenging, sometimes resulting in serious side effects. Now, researchers have developed a new bioelectronic device that delivers vastly lower doses of gamma-aminobutyric acid (GABA), the primary inhibitory neurotransmitter of the central nervous system, to specific areas of the spinal cord in nerve-injured, awake rats. The animals exhibited significant decreases in pain behavior with no observable side effects, in a two-week study. Investigators in the labs of Daniel Simon, Linköping University, Norrköping, Sweden, and Bengt Linderoth, Karolinska Institute, Stockholm, reported the new findings May 8 in Science Advances. “In terms of proof of concept, it’s a really great paper,” said William Schmidt, NorthStar Consulting, Davis, California, US, who provides advice to companies regarding preclinical and clinical studies of novel analgesic drugs. “The investigators showed robust responses in a typical model of neuropathic pain and said they did not see any adverse effects, which is a major issue with GABA [treatment] and with drugs or other treatments that affect central nervous system function,” said Schmidt. “It’s quite exciting,” said Stéphanie Lacour, an engineer who is developing neuroprosthetics at Ecole Polytechnique Fédérale de Lausanne, Switzerland. “To me, one of the major steps here is a system that can [dispense] minute amounts of drug very close to the targeted neurons on demand and in one of the most challenging environments [i.e., the spinal cord].” Neither Lacour nor Schmidt was involved in the current work. Current drugs do not fully relieve neuropathic pain in about half of patients and can cause unwanted side effects. As a last resort, surgeons may implant a drug pump and catheter in the spinal cord to deliver therapeutic agents, thereby reducing drug doses and systemic side effects, but this treatment has an even lower success rate and can cause other serious problems such as drug overdoses from equipment failure and spinal fluid leak. The new paper merges two lines of investigation, one in pain research and one in organic bioelectronics, a field focused on leveraging “plastic” electronics for translation of electronic signals into biological signals and vice versa. Linderoth, a neurosurgeon, had been studying spinal cord stimulation (SCS), which has been used for many years to treat neuropathic pain. In the 1990s, using a rat model of neuropathic pain, Linderoth and colleagues showed that SCS leads to release of GABA in the dorsal horn, along with decreased release of the excitatory transmitters glutamate and aspartate, which contribute to chronic pain (Cui et al., 1997). His work also showed that in nerve-injured rats, intrathecal administration of GABA or the GABAB receptor agonist baclofen (at levels too low to influence tactile allodynia observed in the injured animals), together with SCS, increased mechanical withdrawal thresholds in animals that had not originally responded to SCS (Cui et al., 1996). Linderoth’s work suggested that SCS may act via spinal GABAergic mechanisms, but there is no way to control the amount of GABA released after SCS, and infused GABA or baclofen spreads to other parts of the central nervous system and cannot be targeted to specific spinal cord sites corresponding to the nerve injury. Thus, Linderoth became interested in approaches that could deliver GABA in a more precise fashion to the spinal cord in order to treat pain. More recently, Simon, a materials scientist leading the bioelectronics division at the Swedish Laboratory of Organic Electronics at Linköping University, had developed an organic electronic device capable of delivering neurotransmitters in vitro and in vivo to specific cells (Simon et al., 2009). Using an earlier version of the device employed in the current study, Simon, laboratory director Magnus Berggren, who is also a co-author on the current paper, and colleagues were able to deliver glutamate to cochlear hair cells in guinea pigs. Soon after that, the Simon and Linderoth labs teamed up to develop and test a prototype that could inhibit pain signals more precisely, where they jumped to the spinal cord. “We developed a device that can deliver the same substances the body uses to turn off pain to an extremely local area at high precision with low doses,” said Simon. The new experimental device is an organic electronic ion pump assembled from plastic that conducts electricity. The handmade device was configured with a small reservoir leading to four delivery channels. The channel outlets were aligned with the four sites where the afferent sciatic nerve bundles enter the spinal cord so that GABA could be delivered directly to and bathe the synapses and receptors at those locations in animals who had undergone spared nerve injury (SNI). The device is activated by an electric current; in this case, first authors Amanda Jonsson from Simon’s lab and postdoctoral fellow Zhiyang Song from Linderoth’s lab used a laptop and a standard power supply to generate the current. Application of the current pushes positively charged GABA molecules out of the reservoir, through the delivery channels, and into the dorsal spinal cord. The device delivers limited amounts of GABA, which dissipate quickly. During the two-hour infusion of GABA from the implant, the seven SNI rats in the study’s test group showed significant decreases in pain behavior in response to tactile stimuli, as indicated by increased withdrawal thresholds of the paw corresponding to the nerve injury, compared to control animals in which positively charged hydrogen ions were delivered instead of GABA. Importantly, the researchers reported no observable side effects often seen with GABA or baclofen administration, including drowsiness and muscle weakness, in their short-term study. The authors estimated that the highest concentrations of GABA used in the study were only about 1 percent of those required by intrathecal pump to achieve the same analgesic effect. The team is following up to identify the minimum concentration of GABA needed for a therapeutic response. For pain treatment (and other indications), the authors caution that their prototype device remains many years removed from clinical use for several reasons. For example, for people in pain, rather than using GABA itself, which activates both GABAA and GABAB receptor subtypes, a more selective molecule, such as baclofen, may be a better choice to avoid side effects, Linderoth said. What is important is that the drug be capable of being charged and not too large. Several molecules used in pain therapy will fit into the device, including baclofen, which is about twice the size of GABA, as well as opioids such as morphine. The researchers are working on expanding the repertoire of molecules that the device can deliver. Furthermore, the device will need to be as supple as the surrounding tissue, Simon said. 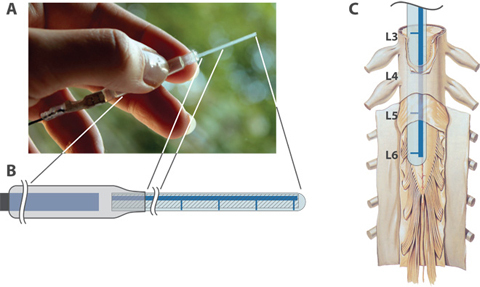 The experimental implant is made of flexible plastic akin to an overhead transparency. But softer material will likely be needed, suggests a recent study by Lacour and colleagues (Minev et al., 2015). They found that a similar fabricated implant, used to help paralyzed rats walk again, resulted in motor deficits due to spinal cord injury, whereas the use of a softer material did not. In addition, the device used in the current study for rats will have to be engineered for human use by altering the size of the delivery channels and in other ways. Increasing the lifetime of the device will also be necessary, the authors wrote. Linderoth envisions the same technology being adapted to deliver therapeutic molecules to targeted local areas in the brain for Alzheimer’s disease, Parkinson’s disease, and epilepsy (in fact, Simon and collaborators in France recently demonstrated that an organic electronic ion pump could deliver GABA to a highly localized region in a mouse brain segment in vitro and suppress epileptiform activity without affecting nearby neurons (Williamson et al., 2015). The technology might replace implanted cells releasing nerve growth factor that Linderoth and his colleagues are testing in people with Alzheimer’s to counter brain shrinkage and neuronal degeneration (Ferreira et al., 2015). With regard to pain, the experimental device may also have veterinary applications, added Schmidt, because side effects from pain medications can be greater in animals such as cats and dogs than in humans. Image credit: Jonsson et al. Therapy using implanted organic bioelectronics. Science Advances. 08 May 2015; 1:4. e1500039.